- Bonnie, Jeremy, Damon and Stefan planned to kill Katherine. With the help of Caroline luring her to a room upstairs, Damon and Stefan confronted their nemesis and had her trapped because Bonnie cursed the room with the same spell she put on the tomb awhile back: no vampire could leave. Damon and Stefan went about stabbing Katherine with stakes, but there was a problem: Elena - who showed up at the party because she was suspicious when she didn't hear from anyone all day - felt every stab wound, as well. Turns out, a witch named Lucy had cast a spell that connected Katherine and Elena. We had met Lucy earlier, as she appeared to owe Katherine a favor and this was clearly it. As a result, the brothers ceased their attack and pretty much just hung out with Katherine in the room. But Bonnie took action, confronting Lucy and grabbing her arm. Both witches them felt something. For Bonnie, it was that she could trust Lucy and she acted on that instinct by giving her the moonstone. She then passed it along to Katherine, but she cursed it. When Katherine got her hands on the item, she went down, paralyzed. Lucy yelled at Katherine for not telling her another witch, a Bennet no less, was around. She proceeds to tell Bonnie they are cousins before leaving the party. - With Katherine mobilized, Stefan approaches Elena, who has now healed because Lucy removed the spell. But she isn't ready to get back together with Stefan because too much has happened and she needs to make sure her loved ones are okay. (Jenna is back from the hospital, at home with Alaric.). - Damon locks Katherine in the tomb again, but not before she yells about how they need her to protect Elena. What does she mean? It's unclear. 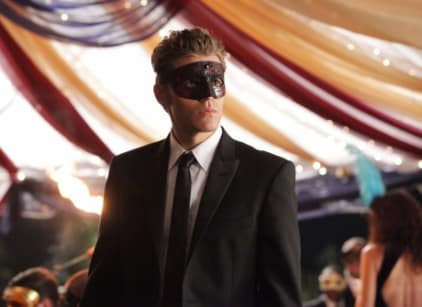 But the episode concludes with someone in a mask abducting Elena from the party parking lot. - Also: Matt tries to provoke Tyler because Katherine had compelled him to do so. But a random female student is killed in their fight instead, meaning the werewolf curse is now upon young Mr. Lockwood.